In this episode: A parent says she feels helpless because her 2-year-old has been hitting other kids. She says her son loves people and enjoys playing with others, but parents are now keeping their kids away from him. She has tried several approaches, but nothing has worked, so she’s looking to Janet for some fresh advice. Hi, this is Janet Lansbury, welcome to Unruffled. Today I am responding to an email from an anxious parent whose toddler’s been hitting and pushing other kids. She’s tried a few strategies to stop the behavior but it’s continuing. She says she’s feeling helpless and she’s looking for some guidance. “Hi Janet. I’m not sure if this is the right way to reach out to you but I couldn’t really wait any longer to seek your help. My two year old toddler has been hitting other kids since he was twenty months old. I’ve tried staying calm, talking it out, taking him out of the situation, time-outs, etc. He seems to be doing this not out of anger but just as a thrill. He keeps beating kids on their face and pushing them. Okay, so a few things stuck out here for me. The first is this parent’s comment, “He seems to be doing this not out of anger but just as a thrill.” I can certainly understand why she sees it that way, because sometimes children do seem to be smiling or excited, you know in a positive way when they do these kinds of behaviors. But, I feel like it’s going to take this parent in the wrong direction completely if she actually perceives this as thrilling for her son, in a positive way. That he’s having a good time when he’s doing this. I don’t believe that’s true. I think he might well be in an excited kind of danger-state because he’s known for a long time that his mother doesn’t want him to do this. That he’s doing something wrong. It’s this impulse that he keeps doing. You know, maybe the way we would be following an impulse to do a behavior that we know isn’t positive. But there is this excitement about, I’m going to eat this really decadent desert, even though I’m on a diet. Or whatever it is. So, this isn’t happy camper, “I’m really having a great time here” behavior. And the problem with seeing it that way is that it really distances us from our child. We start to see them as somebody that’s just so different from us in what they like and what they like to do. That’s dangerous because children actually need the opposite. They need us to give them the safety of our calm response and our on it response. That’s one thing that I hear in this parent’s note is that she’s letting this kind of stuff go a little bit rather than being on it. And children, they don’t feel safe — like us if we’re in the candy store or the soda fountain and we’re on a diet and nobody’s there to stop us. It’s not a comfortable feeling. He needs so desperately to feel his mother’s protection and to feel protected and safe, we have to feel also accepted and understood in our behavior. Which I realize is hard to do, but it’s especially hard to do if we see him as actually enjoying this icky stuff. So, that was the first thing that stuck out for me that I would love to help this parent see differently. See the scared little immature guy there that knows very well that he’s doing something wrong. He learned that the first time that he did one of these things by the reaction. Children are very tuned into our reaction. We don’t have to give them the lesson more than once that this is wrong. But, he’s going to do it. His impulse is telling him to do it. He needs his parents to really love that little guy and feel for him and give him that help that he needs. So, the way that this will look for this parent is being on this behavior in a physical way right away, preventative if possible. That could mean being what I call a buddy guard. Being next to him. Seeing when he’s going up to a child. One of the situations she describes is, he may be playing alone and if he sees babies and other kids playing by themselves or with others, he runs up to them and hits their face or pushes them down. So, seeing when he’s running up to other children and starting to be able to perceive even that energy in him, if possible. That’s not always possible. That excited, “I am in my impulse,” energy that he really needs help with, right away. Ideally she would be there, and that doesn’t mean every second for the rest of his life forever. It just means while she’s helping to give him different messaging here. When she says she’s staying calm, that’s good. Talking it out isn’t helpful because, imagine you know you’re doing something wrong, but you did it. You ate the chocolate sundae and now the person that you’ve asked to help you with this impulse or that you need to help you with this impulse is now telling you, once again, “Well, chocolate has this many calories and you know, makes you gain weight and this is bad for your body.” And all of that stuff. Talking about it doesn’t help. So, I would talk way less, maybe not even say anything. Just being there. “Whoa, I’m going to stop you. Yeah, I saw you wanted to hit.” While your hand is there … I was describing this to somebody and I liked the way they translated it. They said, “Oh, you’re saying block before talk.” So, I’ll use that. And then when you talk, just say something that’s really connected to your child. In a positive way. In a helpful way. In a “I’m here to keep you safe” way. Like, “Whoa, I saw you were doing that, I’m here.” Or “Seemed like you wanted to say hi to them, but I’m not going to let you do it that way.” And before you say those things, your hand is there. You’re not picking your child up and taking them completely out of the situation. That’s overkill. That’s an overreaction that just teaches him, whoa, I can’t handle these situations and I’m not safe. And my mother’s afraid of me and she thinks that I’m a bad kid that she’s gotta like, take me totally out of the situation. I mean if something is rampant and it keeps continuing, then I would say, “You know what, I think we’re going to have to go.” or “I think we’re going to have to go into another room for a bit because you’re not safe here” And then I would consider whether you can go home or have the play date at your house another day. Seeing that he just can’t do it right now, for whatever reason. Beating kids on their face and pushing them, so none of this is okay to do. And she can’t let it happen. And when it does happen and when it gets away from her. When it gets away from us as parents, instead of going in and now making it worse by telling him how wrong he was, again. And she’s going to make him say he’s sorry, which I don’t recommend. I have an article about that on my website, “You’ll Be Sorry.” That explains my view on that, but it really is not helpful. Again its a … Let’s go back to the chocolate sundae. Now you have to write an essay about how you shouldn’t eat a chocolate sundae. That’s sort of what were asking them to do. It’s not going to help. It’s only going to make things worse. It’s only going to make him more aware that he has a big problem that you want him to solve. That you’re not going to be there just to help stop him. And he’s showing you that for whatever reason he’s not ready to do it. He’s not ready to solve this problem himself. He’s not ready to stop and this is probably not just going to phase out without some cost in your relationship. I realize this could be seen as totally permissive. It is absolutely not. It is not letting any of this get away from us but seeing it for what it is. And when children feel like we see them for who they are, these wonderful souls that, yeah they’ve got a lot of impulsive behavior. And we may be able to figure out other places that it’s coming from. When a child is more tired. When a child is hungry. Going through a big transition or just dealing with a small daily transition. But, another reason it could have been is that the child tried it out once, maybe it was a little bit of a sensory seeking hit or something. “I just want to feel these people’s bodies that I’m coming up to.” Or, “Somebody’s next to me, what happens if I do this?” And then the response they get turns it into an issue. Turns it into, “Wow, they don’t have a handle on this. I’m on my own in this. I’m not safe.” And that feeling of insecurity inside is what creates more of the behavior. I was talking to my husband about this podcast and this question this parent asked and he was saying that he remembers when he was younger and he just wanted to see what would happen if he pushed somebody really hard or hit someone. It wasn’t out of anger. It wasn’t … I guess you could say it was like this mother said. It was like a thrill, but it was more just an exploration. So, if children explore this way and the result is that people are talking to them about it, obviously upset. They’re getting isolated in time-out for it. That’s an experiment they might have the impulse to keep trying. To see if they can get that protection. To understand why they have such power. I’ve worked with families that have children that just keep doing that. They keep out of the blue hitting or pushing and we’ve worked hard on figuring out what’s going on. A lot of times we don’t have the complete answer, but what always works is just to be there for our child. To stop our child right away. More action, less talk. Saying very little about it. Then letting it go right away. Getting ready for the next one, if it happens. If it seems overwhelming and we don’t want to handle that anymore, we leave. We respectfully take our child out of the situation. Respectfully towards our child. Not just carrying them out like a wild animal. So, yeah, these are challenging situations and I can certainly understand this parent’s concern and it’s very frustrating. I know I work with a lot of parents with this issue and it does go away. And it goes away sometimes immediately when that parent starts to take more calm physical control. Being ready. Being on our child’s team and letting them know that we’re there to help and we’re going to stop them right away. Not expecting our words are going to be able to do that, because they aren’t. This sounds so much like something my son was going through at 18 months. I was pregnant at the time and really struggling with my son’s behavior. Janet’s approach and articles on this have helped us a huge amount, and 8 months on, his hitting is a rare occurence. His vocabulary has also developed a great deal in this time, and I believe that has helped him process what is happening too. I also want to say that it’s been really important for us to have compassionate friends in our lives. 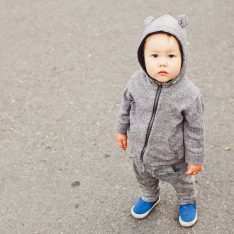 People have found it all too easy to misunderstand and judge our son (and us as his parents) at this age and that has felt very isolating at times. It is reassuring to hear that other parents go through this stage, and that we aren’t alone! Yay, Nadya! I’m so glad this approach helped you. I also agree completely with having compassionate friends in lives. Children need compassion and we do, too! This article resonates so much with my stepson however he is quite a bit older, but often acts like a toddler still. Do you think this is possible to teach to an 8 year old? Who seems to be stuck in an impulse control physical pattern with his 5 year old sister…it drives everyone crazy how much he physically torments her, then he gets the negative reaction from her and then his father reacts emotionally, admittedly, on a bad day I do too – as it is incessant some days, seemingly purposeful and cruel. The talking doesn’t work. Consequences don’t work. Asking her to sit with me is the only thing I’ve found to work, telling her I’ll keep her safe – but on a good day she wants to still go and play with him! I’d love to teach them all RIE but they are only with us 50% of the time, and quite active so it’s hard to be physically between them. I also have a newborn due in 4 weeks which I’m planning on implementing RIE with – but with two out of control step children it seems near impossible to help them! It might also be well worth researching Sensory Processing Disorder issues for this child. My three-year-old son was repeatedly pushing other children, despite knowing it was wrong and genuinely feeling bad about it, and thank goodness his school psychologist observed and suggested SPD. Fifteen months later and two rounds of treatment later, he’s like an entirely different person in the best way: he’s able to use words instead of pushing, he’s so much more in control of his self-regulation, and we (his parents) were better able to respond to his physical needs while also using RIE for his emotional ones. I strongly recommend finding a specialist to see if this might help this mother. Thanks for sharing your experience, Ellie. I agree that it couldn’t hurt to get an assessment. I’m glad you found the help you needed. What about for a two and half year old who hits mom, dad, grandpa, grandma on purpose when he is mad? If we say no to something or say he can’t do or have something his reaction is to say “No mommy!” and start hitting. I’m at a loss what to do. He knows he is doing it, is very verbal and I put him in time out for hitting. When I walk back in he says “We don’t hit Mommy I’m sorry” and he hugs and kisses me. Would love to hear Janet’s thoughts on this, as well. My 3 year old does the exact same thing — physically striking me, his mother, uncle, and grandparents when he doesn’t get his way. Not sure when you posted this comment, Coreen, but has any progress been made? The best we’ve come up with is to physically restrain him with our hands, holding him and trying to determine if he’s hungry or tired, or if he’s just simply frustrated due to not getting what he wants. Sometimes we can catch him before he hits, and perhaps that’s the best time to hep him work through it — but that’s not always possible. My guess from reading Janet’s writings is that the best we could do is to catch him before he hits, hold him, and let him know that we’re here to help him work through his big feelings? But, I also see her saying less talk, more immediate action — so it’s a little confusing. Wish she’d chime in on this one. Hi Janet! I am a new follower of your blog <3 I'm trying to find a way to carry this over to my child's (3 yo) latest um… behavior. He isn't hitting or biting, rather he's too affectionate! He tries to hug everyone at his nursery school, hold their hands, kiss them, squeeze their cheeks-teachers included! Dad and I are affectionate in an average sort of way with each other …. but I would say really affectionate with our nugget..oy! I get a little embarrassed when my sweet boy does this. He makes this face where he grits his teeth.. almost like an adult would do when they say something like, "oh, I just wanna squeeze those cheeks", when they are overcome with love and adoration for a new baby. I'm going to try to step in and "block" before it happens, but I'm concerned because I'm not at school with him. Hi Erica, and welcome! 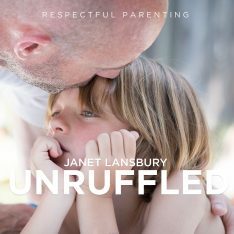 I have a post on that topic with more ideas for you:https://www.janetlansbury.com/2010/06/can-babies-love-too-much-teaching-children-to-give-affection-with-respect/ You obviously can’t intervene when you’re not there with him as school, but the way you handle this behavior when you are with him will make a difference. He just needs some different messaging around this. Thank you for this post and all you do. I am experiencing similar with my nearly three year old. But his impulse is more shouting (though he does hit as well), at close range to other children and to adults that try to interact with him. He sometimes has friendly chats with the same adults but most of the time gives a loud “egh”. I originally addressed it by saying you don’t have to talk if you don’t want to but that noise isn’t friendly. I model what I think he should be saying. I have moved on to ignoring now. I am doing my best to be unruffled in the moments. But afterwords I am worrying as is my husband. We worry he will be the kid parents don’t want to be around. We do have a few understanding friends, but are also hearing from family that he is like this because he doesn’t have enough social interaction. He is an amazing little guy with a huge vocabulary, he is inquisitive and loves being physically active. He is my only child and I stay home full time with him. I really try to keep a slow lifestyle and after getting household requirements done I follow his lead and interests. I follow a lot of Montessori methods and am open to home education/unschooling. I am confident in our life choices, but this one area does leave me slightly worried. Am I doing him a disservice?? Sorry this has turned into a long reply, just hoping to find some help. I have a 3.5 yr old sonwith a 4 month old daughter.. my son who has always been a very easy child, almost never tested limits as a toddler ( though I don’t really know if that is healthy) has this impulsive hitting and ‘hugging too much’ behaviour from the time I discovered I was pregnant with the second.. it dint help that he started preschool at the same time.. but after initial impulsive hitting at school he sort of settled.. but after my delivery it has become much more of a problem.. he also puts his fingers in his mouth which is a new behaviour now, I have noticed that he does so when he is unsure of himself as in a new place or if he wants a reaction out of me.. I have switched to unruffled responses.. hope that helps.. I have made many mistakes parenting him like I never let him barefoot or let him explore all rooms of my home as an infant.. I was obsessed with cleanliness and never let him keep/explore anything with his mouth as an infant.. is that causing his finger in mouth behaviour? I have a cousin of mine living in another city, her maternal home is near my house and she brings her kid 4 year old and her brother’s kid 7 year old boys to play in the yard in my house..When the two boys come they keep to themselves and are not open to playing with my child.. they come to ride their cycles but are too fast for my son.. the 7 year old lives near my house all the time.. (but I have not taken my son there to play with him before my delivery, I don know why .. may be I was tired with my pregnancy and I was working full time.. and I dint think a 7 year old would like playing with a 3 year old.. maybe if he was already friends with the 7 year old, then my son could be accepted easily as a play mate?) that is not a pre arranged play date.. just an informal gathering.. she just comes in if she is in town.. my son likes the 4 year old but impulsively Hits him and hugs too suddenly.. the 4 yr old keeps on calling my son bad boy.. my son sometimes is aggravated but mostly doesn’t bother.. he still likes the 4 year old.. once he hit the other boy and I dint press him to say sorry he took his best toy and offered it to the other boy who refused to touch it and so my son was upset.. the other kid was hungry by that time and his mother left with him and after that my son was asking “why did he go”.. I just told him his friend was hungry and so they left..
1. When my child Hits and then genuinely says sorry or makes amends but is not accepted by the other child and so is upset what do I do..
3. When the other child keeps on calling my son bad boy( under his breath so that his mother doesn’t hear him, she rebuked him once for that name calling) every time he nears my son what to do.. it might be getting to my child..
5. It doesn’t help that my son is not patient to know the basic rules of playing games like piggy in the middle (he gets angry if somebody takes the ball without him getting it) or football( that is you hit towards an area which is your goal post and not in the opposite direction.. ).. he also is not dextrous enough catch balls.. those kids love ball games and the fact that my son caanot play them well also has an impact probably? I tried teaching but he is not interested.. and he doesn’t wait n observe the rules before going the game..
wo months back we had to attend a funeral and because I had to be with my baby I couldn’t be with my son at all.. there were lots of children and my mil was keeping an eye on him.. that was when his impulsive hitting was too much.. he must have been over excited and hungry.. according to my mil he kept on hitting others.. we couldn’t leave as it was a close relative of ours who passed away m we were the hosts.. later that day, after I fed him and made him rest my son was in a good mood and went to play again, he was met with “take him away, he will hit ” from other kids.. you have said that loving your child means seeing to that he s not perceived as a brat.. I feel so guilty.. those are kids we see very rarely, so I guess they would be more accepting when they see him again after months.. but I am concerned about what my son thinks of himself.. I believe in his goodness.. and I will show him that.. but what will peer rejection do to him? 7. And I live with my in laws so all that I am learning from reading your articles and implementing at home, I can’t make them do too.. will different people at home handling things differently confuse my child? Is it enough that I change, or should I press for the same change in my in laws in the way we handle my son.. I am asking this because convincing them is tricky.. I know the post is long n may be incoherent but that is how I am feeling now.. hope you reply.. thanks already.. I feel around 50percent lighter already after reading your posts..
Hi, This advice makes a lot of sense, yet I don’t see how practical it is for a child who keeps hitting a sibling. I am dealing with this with my 3 yo who keeps hitting his brother, who is 2, on the head or biting him. This goes on at least a few times throughout the day. I can only remove them from each other for so long especially since they both want to be with each other a lot and want to play with each other. I feel like how am I supposed to be watching him constantly at his side the whole day? Is there any other practical tips because I am at a loss!